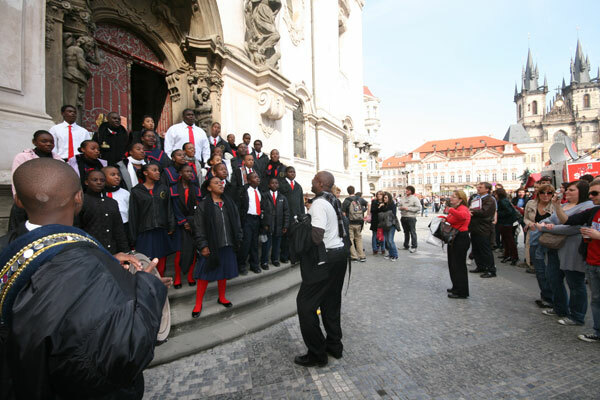 PRAGUE, The Czech Republic -- The Bahamas National Children’s Choir attained the Bronze Level at the Young 2010 Prague Festival and Competition on March 27, 2010. 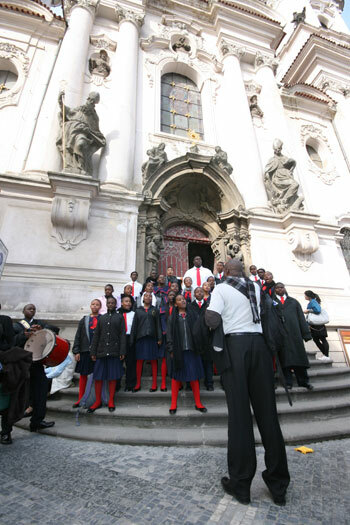 This was the first time that the Bahamian choir competed in the event and was the only one from the Western Hemisphere taking part in any division. 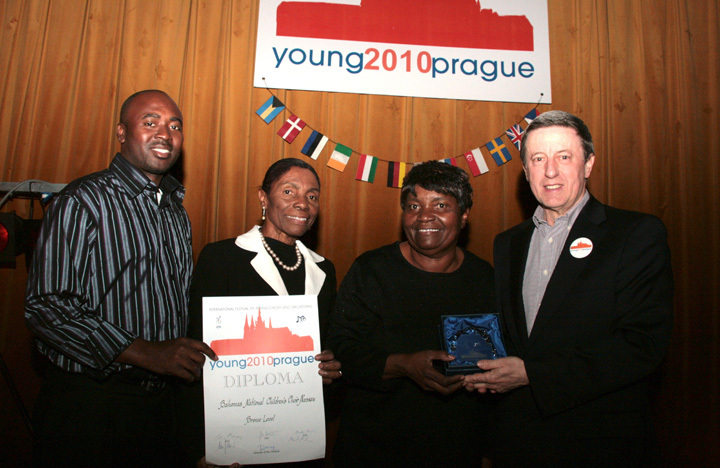 Pictured from left: Assistant Director, Alfred Dean; Director and Co-Founder, Patricia Bazard; Co-Founder, Audrey Dean Wright and Director of Festival for Young 2010 Prague, Jiri Pokorny. 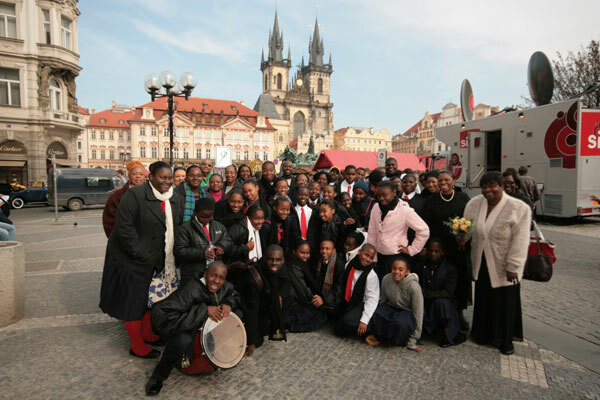 Prague, Czech Republic - As members and stakeholders of the Bahamas National Children’s Choir waited patiently for their chance to perform at the Young Prague 2010 competition, in Prague, the Czech Republic, Friday, March 26, 2010, they said that they are ready for yet another chance to showcase Bahamian culture and talent to the world. Audrey Dean-Wright Choir Co-Founder added, “I feel confident that we are ready for the competition. “I think that being excited about going gets the adrenaline flowing and even if you feel a little bit of apprehension – apprehensive enough that it does not disturb your performance – that is great. It just helps you to perform better. “I feel that they do not have any insecurities, any fright as such, and I think that they are secure,” she added. “Of course, everyone would like to win; but my thing is that if you are not the winner, you be among the best. “You will be looked at among the best that are performing and I think, to me, that is more important: that you give it your all, put your best into it, represent your Bahamas with not only your singing but also in the way you behave, the way you relate to other people,” Mrs Dean-Wright said. Although it is not the first European competition that Choir member and Queen’s College 10th grader Osano Neely has participated in, he believes the Prague competition is a positive experience. Queen’s College fifth-grader David Allens said the competition is very different; but the fact that he is in Central Europe is special for him. St Andrew’s College 10th grader Brenee Wallace said she is happy to be on the trip because it brought her to Prague. “It is a very beautiful place and I am enjoying every moment of it and I think that we are probably going to bring it home this year,” she said. The Bahamas is one of the countries that met the strict standards to compete for adjudication; the Bahamian choir will not just perform at the international event, as some countries attending the Festival will be doing. The island nation is also the only country from the Western Hemisphere taking part in the event, bringing a new “flavour” to the competition and the region. “I think it puts a great responsibility on us to do even better; but I am very proud, as we are the only people of colour here,” Mrs Dean Wright said. “We gave a concert yesterday and when I saw who I thought was a lady crying during our performance, I looked closer I found that it was a gentleman crying as the children sang. One lady said that the songs came from the heart and, along with the technique, was the heart. She said that you do not always get that. Brenee added, “We have to go a little harder than anyone else because they may have a preset image of who we are, what they expect of us. “With all that we have done, we have a long way to go yet,” Mrs Dean Wright said. “We are never finished. We have never attained the heights that we would like to attain in our choral singing.